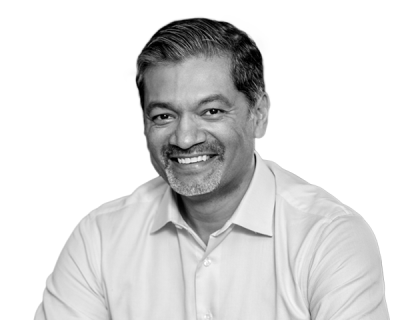 Dev Ittycheria joined MongoDB as President and CEO in 2014 and was formerly co-founder, president and CEO of BladeLogic. Previously being a founder, operator, investor and board member has given him a “360 degree” perspective of businesses, which informs his approach to leadership and building companies. Demonstrating vulnerability is truly an underrated leadership skill. When I first became a CEO, I believed I could never show any indecision or lack of confidence. I thought if I did, I’d lose the respect of my team. But over the years, I realized that’s not true, and that vulnerability is actually a source of strength, not a weakness. And demonstrating vulnerability is a powerful way to build trust across the organization by providing a safe space in which to discuss, experiment and innovate. To create a culture of creativity and innovation, you have to make sure your team feels comfortable giving candid feedback. Now, in meetings, I’m more than happy to acknowledge if I’m confused or I don’t have all the answers. When people see me behaving that way, the tone in the room gets more relaxed and they feel more open to behaving that way themselves—which drives more candor, clarity and alignment. Demonstrating vulnerability is a powerful way to build genuine trust by providing a safe space in which to discuss, experiment and innovate. Your most important job is dealing with people. No matter how much money you’ve raised or how great your idea is, your biggest challenge and opportunity will be assembling and developing the team around you. In many ways, I’m both the CEO and a de-facto head of HR. It’s very important to deal with people problems quickly, especially when it comes to your leadership team. The tricky part is recognizing when someone who may have been effective when the business was smaller is no longer the right person. Sometimes, the business simply outgrows them. Telltale signs of a bad leader are an inability to recruit or retain great employees, because people won’t join or stay long with a weak leader, and it will end up hurting the entire organization. I firmly believe A’s hire A’s, B’s hire C’s, and C’s hire F’s. The quality of any team is directly correlated to the quality of its leadership. Early in my career, I went into one-on-one meetings with a list of agenda items and waited until the end of the meeting to ask the other person if there was anything they wanted to discuss. Then later, I’d get blindsided by an issue and wonder why didn’t we spend any time on it in the one-on-one. Eventually, I realized that when you’re the senior person in the room, it’s harder for the other person to redirect the conversation and be open with you. And if the meeting is all about what you care about, you never really get to know what it’s like to walk in the other person’s shoes, professionally and even personally. Now, I make most one-on-ones very informal and don’t lead with my agenda. Informality breeds candor. We typically start with non-work subjects, like how they spent the weekend or the news of the day. It makes the conversation much more natural, and inevitably, the things that are important to them surface. It’s given me a better window into not only my team members, but the business as a whole. I wish I could speak, read and write Mandarin. I learned French in school but am only fluent in English, and I’m always jealous of people who know multiple languages. Fluency allows you to build much deeper relationships, and Mandarin would be particularly helpful, because China is a going to be a massive market for nearly every business. I’ve thought about taking it up, but I’m not sure I have time to invest in becoming truly proficient. If you want to master something, you have to invest a certain amount of time in deliberate practice. That’s true when you’re learning about a new market, technology or distribution channel, as well. But in those cases, you can leverage prior experiences, dig into patterns and look at what other people have done to be successful. With learning Mandarin, I wouldn’t have regular opportunities to use it, and there would be no feedback loop. I’m currently enjoying Talent is Overrated, by Geoff Colvin. A friend recommended it because it’s very applicable to kids and parenting, but I think it has lessons for business, too. The author makes three key points to refute the argument that some people are born more talented than others. The first is that there’s a big difference between experience and true practice. You can do the same job for 10 years and not learn anything new, or you can push yourself to explore new ideas, learn new concepts and solve new problems. It’s a growth mindset—we all have the capacity to learn. The second is the value of starting early. As a child, you begin with no bad habits to break and have lots of time to hone your skills. A startup is the same way. You can move quickly when you’re small and make big leaps over time. The last point is that even a slight advantage can be a force multiplier. Imagine I’m coaching two kids in sports, and they’re at about the same level. If one makes the cut for a better team and the other doesn’t, the first kid gets not only a confidence boost, but exposure to better coaching, better facilities and tougher competition. Eventually, that kid will develop into a much stronger player. Similarly, if a startup can attract better talent, acquire more customers and raise more capital than their competition, that will create a flywheel effect that’s incredibly powerful. Earlier in my career, I underappreciated how often you have to say something before your team can truly internalize it. For a startup with limited resources and time, it’s so important that everyone is on the same page regarding the organization’s goals and priorities. Aligning teams through strong communications is a critical element of a leader’s job. You will never hear employees complain, “you’re communicating too often.” People are usually starved for information; it’s just that all the distractions they have to deal with prevent them from internalizing what you say the first time you say it. Much like a political campaign, you have to repeat a message over and over again before it fully sinks in. And the challenge is even more profound as you grow and add more people in different locations around the world. Now when I answer a question in an all-hands meeting and then get the same question, I’ve learned to just answer it again and again. Most leaders underestimate how often you need to say something before your team can truly internalize the message. It’s human nature to filter information, especially bad news, when one is speaking to a superior. But that filtration process dampens the sharp edges of the information shared and increases the time it takes for the information to move up the organization. So when I hear bad news I automatically assume that the problem is far worse than what people are telling me—and that I’m the last to know. I can’t be in every meeting or discussion, so I try to do frequent spot checks to assess how things are going across different groups. As soon as I see or hear about something going awry, I start peeling back the onion to get to the root cause—and I encourage my leaders to do the same. Every organization deals with filtered information. But the best organizations encourage sharing bad news fast, in both directions, so they can marshal the proper resources and get problems solved quickly.